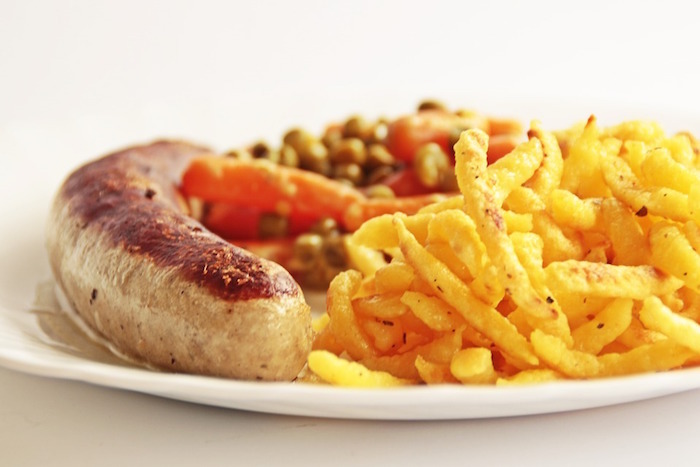 Check Out Our Bratwurst, Bockwurst & Krakauer Sausages! We're well known for being UK's prime hot dogs and German sausages wholesalers and distributors. There is no doubt that our hot dogs and sausages are of the highest standards; our customers praise the products we provide them with as well as our outstanding service. Here we talk about 3 of our most popular sausages we stock: the Bratwurst, the Bockwurst and the Krakauer. Please visit our testimonials page to find out what our customers say about us. For more information on sausages wholesale please visit the page. Who hasn't tried the Bratwurst sausages at some point in their life? Everyone knows this superb German sausage: the Bratwurst has 'travelled' all around the world and many catering businesses in the UK pride themselves in serving it as part of their discerning menu. As it happens, the Bratwurst is one of our favourite sausages and it is easy to see why: the finely chopped meat and spices has culminated in something that has everything anyone could ever want in a sausage. A great product to have with sauerkraut, potato salad and mustard (German mustard, of course). There are different varieties of Bratwursts but we particularly love the one we import from Germany. We are very selective when it comes to our products and we only import what we believe is the best from our award winning butchers. As mentioned on this post, we tried a different variety of award winning butchers that make a good Bockwurst but we ended up sticking with our own production because we found it to be, very simply, the best one. The Bockwurst is a glorious hot dog. It has all the properties of the typical frankfurter but without the strong, herby flavours. This sausage has been smoked so it carries with it that particular flavour that people love. This is definitely a winner sausage and if you are thinking of integrating it within your hot dog and sausages menu we most definitely recommend it. Last, but not least, we'd like to give a special mention to our fantastic Krakauer sausage. We also call it 'Bacon Frankfurter' and we believe we ours is simply superb. We like to say it is like an American hot dog with a German twist. We've given the sausage a very personal make-over by adding juicy, good quality bacon 'bits' to enhance its flavour. The end result is simply an incredibly tasty Krakauer. This pork hot dog will have your customers raving about your hot dogs and sausages! The smoky flavour adds such incredible taste to it, just try and see. This sausage is smokier than the traditional Frankfurter and with the natural casing added for the perfect snap you simply have a winner product as part of your menu. Available with or without skin, we can also provide you with custom sizes. In fact, we can provide custom sizes with a lot of our hot dogs and sausages, please call for more information on this. There you go! Three of our favourite sausages and you can easily see why. If you check our brochure you'll be able to browse through all the different products we import from Germany. Please get in touch if you'd like to try a particular product as well as finding out about deliveries, availability/stock, shelf life and prices. We provide first-class hot dogs and sausages. We have been importing our products from Germany for many years now. Please check out our hot dog equipment if you'd like to franchise with us. If you're interested in our sausages at wholesale prices please contact us.